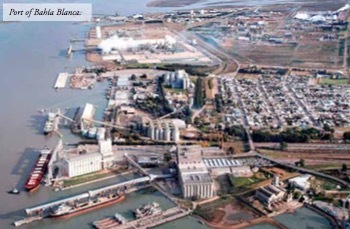 In Argentina, Louis Dreyfus Company (LDC) has inaugurated an extension to its Bahi´a Blanca Port Complex. Among the work undertaken was the creation of a deepwater harbour and construction of a grain conditioning plant. Taken together, this is one of the most important infrastructure projects developed in the country in recent years. In total, LDC invested $16 million in the expansion, which brings to $76 million investment over the last five years. At its Bahi´a Blanca terminal, inbound grain can be handled from both rail or road, while vessels drawing up to 45 feet of water can be accommodated. In 2015, traffic at the terminal amounted to 1.2mt (million tonnes). Going forward, with the expanded work area in place, LDC suggests it will be able to accommodate up to 2mt annually.